mom of three knits a little, bakes a lot, crafts a bit, and writes about it all here. It’s time again for another issue of the Collectively Creative series: the Lucky Edition. Many thanks to Kelly at Cobwebs, Cupcakes & Crayons for organizing the series and serving up the inspiration each time. Be sure to check out the other bloggers’ “lucky” posts (links below). When I was a kid, finding a penny on the sidewalk was lucky. Realizing that your parents hadn’t noticed that it was already past your bedtime was a bonus, and reaching into the cookie jar and pulling out two cookies stuck together? Totally lucky! When I was older and in school, lucky meant no pimples on picture day and no tests because of a snow day. And with each passing year — from middle school to high school and through college — I met some amazing people whom I was lucky enough to call my friends. When I became a new mom of my first-born, I felt lucky if I could get a shower each day, if the baby slept on schedule, and if I could fit back into regular-sized clothing (not the clothes I wore before the baby, you understand — but just regular-sized clothes). Oh, and the moment he slept through the night? Miraculous. I knew I was lucky to be his mom. When I then became the mom of twins, I felt lucky if I could get a shower every third day or so, if I could harness one baby into a highchair before I completely lost track of which way the other one had crawled off, and if I didn’t have to run to the store with all the kids in tow. And I couldn’t believe my luck at having a front row seat to watch these three little lives unfold. And these days I feel especially lucky when my kids burst through the door after school, when we all watch movies together, when my daughter and I knit together, and most of all when they hug me. *This recipe for ebelskivers defines luck in our house. They are similar to donut holes — but with filling. They only use a few ingredients that you probably already have in your pantry, and they have that elusive element of luck to it — around here, you never know what kind of filling you might get. 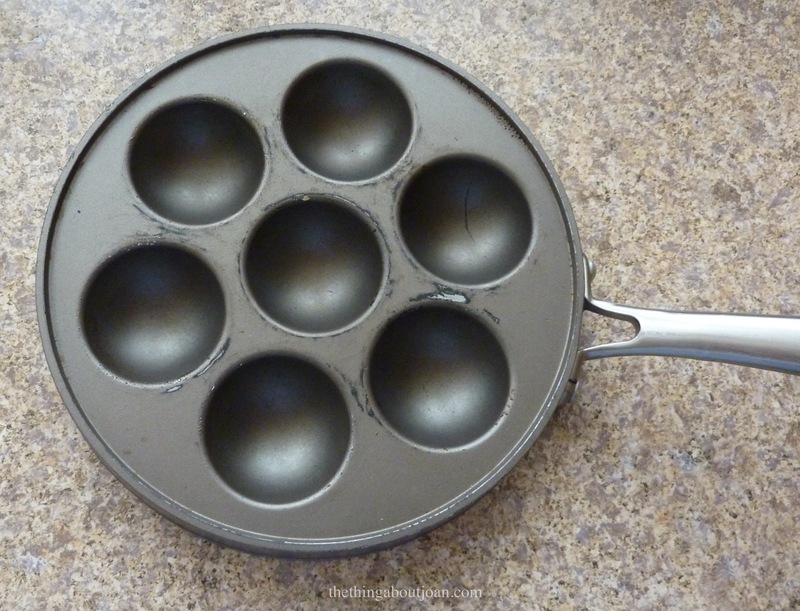 You’ll also need a special ebelskivers pan (shown below) and 2 chopsticks or forks. The pan can be found in specialty stores or online for anywhere from $9 to $30. 1. Mix dry ingredients (flour through salt above) together thoroughly in a large bowl. 2. In a separate bowl, mix the wet ingredients (eggs through vanilla above). 3. Add the wet ingredients to the dry ones all at once. Mix — but be careful not to overdo. Some small lumps are okay. 4. Heat pan over medium-high heat. 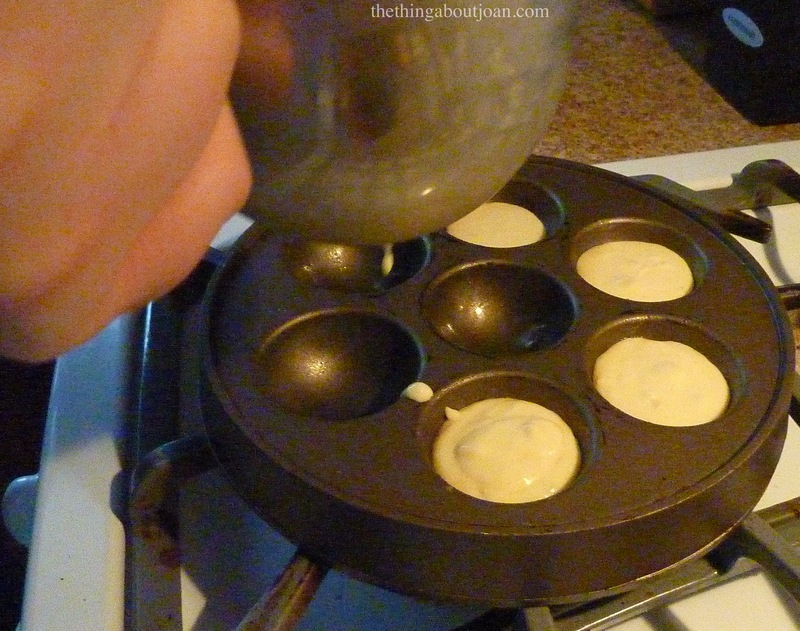 Grease the cups of the ebelskivers pan with butter. 5. Drop spoonfuls of batter into the cups of the pan. 6. Add about a tablespoon of the filling of your choice. 7. 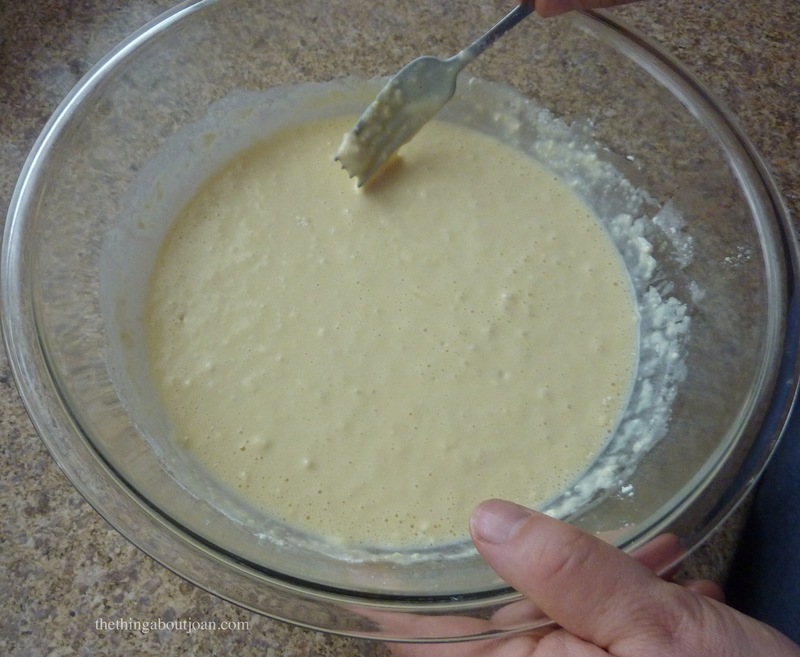 Using a spoon, fold batter over filling until just covered. 8. Cook for 1-2 minutes. 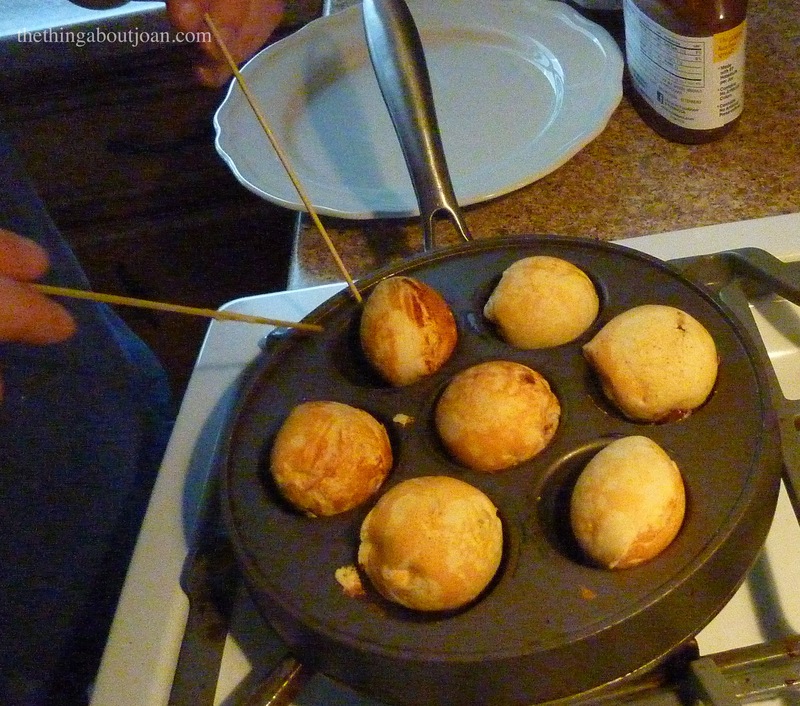 Then, using chopsticks or two forks, carefully flip each ebelskiver over. Cook for 1-2 minutes more. 9. 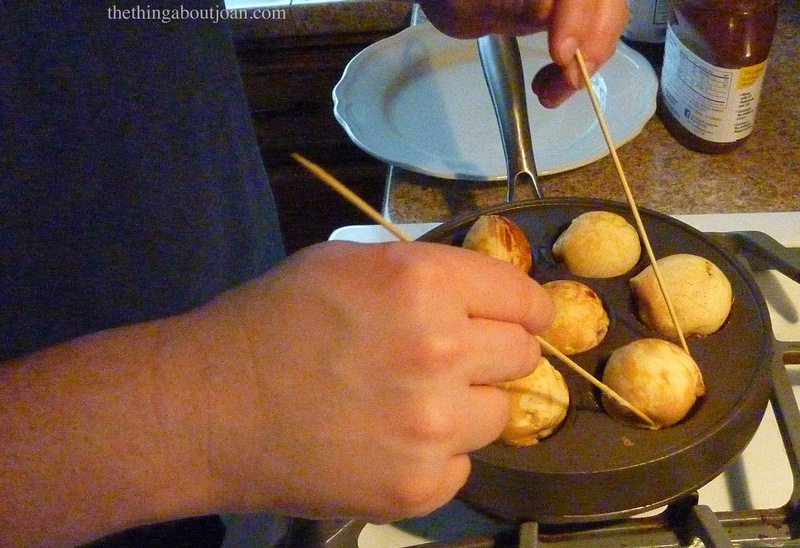 Slide all ebelskivers out of the pan. 10. Since we make so many of them, we put each batch onto a plate in the warming drawer of our oven. 11. Right before serving, dust with powdered sugar. Snag a few of them before the rest of your family eats them all! Don’t forget to check out the other bloggers’ posts in this “Lucky” edition! There’s something for everyone — see? Mom of three who knits a little, bakes a lot, crafts a bit and blogs about it all. This entry was posted in Baking, Cooking, Family, Mothering and tagged Collectively Creative, ebelskivers, food, kids, motherhood, parenting, parenting humor, recipe. Bookmark the permalink. Thanks, Katherine! 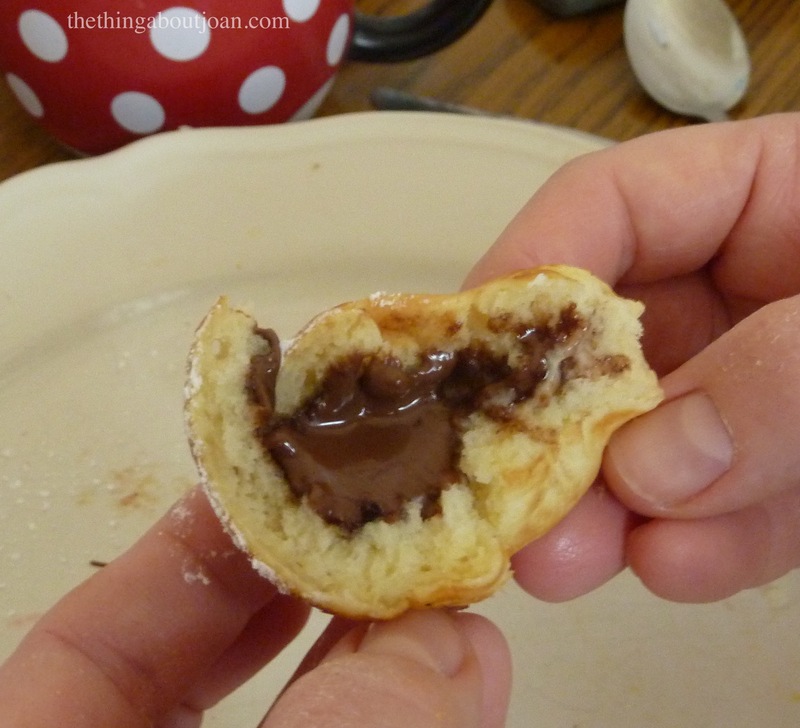 Those little ebelskiver gems are addictive — especially the Nutella ones! What a sweet and lovely post! It’s so interesting how we all define “lucky” at different points in our lives — always changing, always evolving. And your recipe for Ebelskievers sounds fantastic! I will need to purchase myself one of those pans because this is definitely going to need to be made in our house! Oh Kenley, I hope you love those ebelskivers! We could easily make a triple batch around here and not have one left over. A friend of mine makes savory ones as well — with bits of ham and cheese and green onion. Those are also crazy delicious! It’s weird how the meaning of “lucky” changes over time. When I was a kid, I felt lucky to stay up late; now I feel lucky if I can grab a nap! They’re good! My husband suggests that you can tinker with the batter recipe too — maybe less sugar with the savory ones or maybe try adding cornmeal (I haven’t tried that, but that does sound good!). 🙂 And thanks for the tip on tweaking the batter for the savory ones. Oh I hope you do! If you try it, let me know what fillings you chose and how you liked them! Thanks, Ingrid! They really are little nuggets of donut-and-filling goodness. We got our ebelskiver pan as a gift — from a person who knows our terrible habit of picking up specialty pans for stuff. But we make these little bites every couple of weeks for our Sunday breakfast. And I’ll bet your little one will love them too! Oh! just like us, we love “specialty pans” too! hubby loves it when they are different! 🙂 Sunday breakfast seem fun and delicious at your house! He sounds just like my husband! I think we saw ebelskivers on one of the millions of cooking shows that are out there and he was hooked. Then a friend got us the pan and, well, here we are! I love all the kitchen gear, but I’m worried we’re going to need a MUCH bigger kitchen if we keep this up. Joan, this post is SO funny, heartwarming, and true! I love how the meaning of “Lucky” has changed throughout the years for you. Another great post about perspective! As always, I love the way you tell a story – you have a great writer’s voice! Leah, you always leave the most supportive comments about my writing — and I love that! It’s been lovely getting to know you through your blog and here. Makes me feel lucky we live in the age of the Internet, you know? 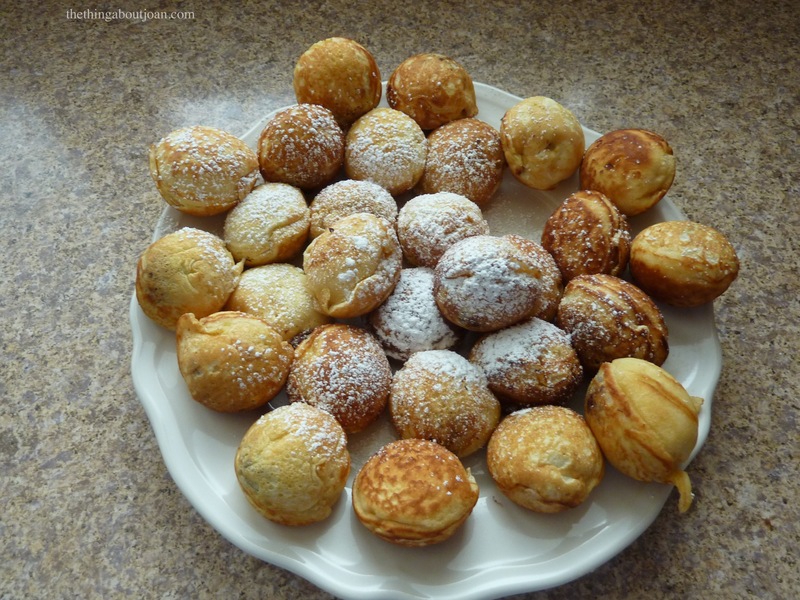 Such a down-to-earth and wonderful post…and those Ebelskivers look so tasty! Thank you for sharing both your thoughts and the recipe! Thanks, Kelly! You are so sweet! Have I mentioned to you lately how much I adore this series you created? Thanks, Mtetar! Hope you have a lovely day! What a lovely story. I like to think of these “lucky” moments as little miracles. It’s amazing how drastically one decision can change our lives. And yum…ebelskivers! I don’t have an ebelskiver pan, but we have a wonderful European bakery down the road that makes huckleberry ones! That’s a great way to look at them — “little miracles.” And I know exactly what you mean by that. I often wonder if I hadn’t gone to the college I did (which was out-of-state for me), would I have met my husband? Oooh, huckleberry ebelskivers! Thanks for the tip — I think I’ve found a new filling to try! Joan, what a great post!! Love this!! Also, I was getting so excited as I read the ingredients….I have everything and was thinking I could make these tomorrow….and then I came to that pan….oy! I do not own one of those but you bet your bottom dollar I am going on the hunt now for one!!! Those look so good! And how truly lucky are you that your husband made them!!! Great stuff! I know– the pan! I hope you get one and try them. Let me know what you think if you do — I love them so much I’m like an Ebelskivers Evangelist. Thanks, Thea! I love writing on these Collectively Creative post topics that Kelly comes up with! I really like your post… I felt like a bad mom tonight since i was yelling and loosing my temper soo easily… but your post reminded me how lucky I very am…! thanks! Oh Josee, I get it. I’ve been there. I think we all have. Thank goodness for other moms who understand! oh yeah! only a mom can understand that! Loved and loved your post. I feel lucky too esp when my boy makes a sock monkey or designs an amigurumi! I know what you mean. When I’m crafting with my kids, I slow down enough to really be present with them. And how fantastic that your son likes to design amigurumi and make sock monkeys! I remember feeling lucky when I got out of maternity clothes! Love this list of “lucky” things. And the Ebelskivers look wonderfully scrumptious! That was the best feeling, wasn’t it? Especially because I had worn them so often and I despised them by the end! 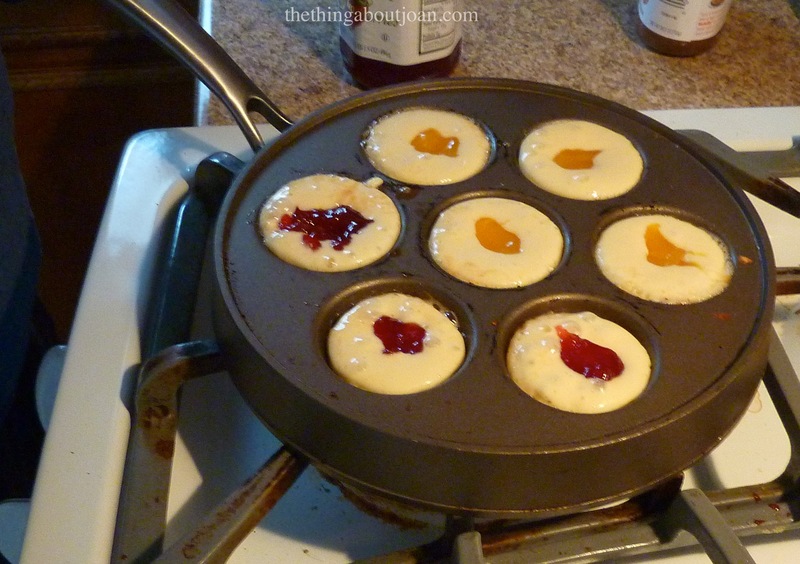 This is the 2nd blog post I’ve read this week with a recipe for ebelskivers! I had never heard of them before. It’s a sign — I have to try them. You can deny the signs! They are so addictive…. I’ve got three kids too — oldest son and then twins followed. That first year with two babies was crazy, right? It’s funny how ‘luck’ hinges on it’s surroundings. One minute you’re thankful for all of life and the next minute you’re thankful there was an extra M&M in the bag when you thought it was empty. And now it’s your kid’s turn to feel lucky to have a mom who realizes the joy of watching little lives grow. And boy, I think it’s every mother’s hope that her kids are going to feel lucky that she’s their mom — it’s definitely mine! I know I feel grateful for my own parents — even more now that I’m a mom than I did when I was a kid. Your children and husband are truly lucky to have you, Joan 🙂 Thank you for sharing these thoughts! I’m in phase where showering every other day is a luxury with two kids…is that how it works? Days without showering is directly proportional to the number of children you have? 🙂 Some days when life feels really hectic and crazy, I have to remind myself how lucky I am to be their mother and enjoy the simple joys of life! Believe me — I know what you mean about trying to remember how lucky you are when you’re in the thick of dinnertime/bathtime/diaper changes/etc. Even now that I’m past that particular stage with my kids, there are days (most days, really) when I am lucky if I can find the patience to swim through the chaos. Great post. 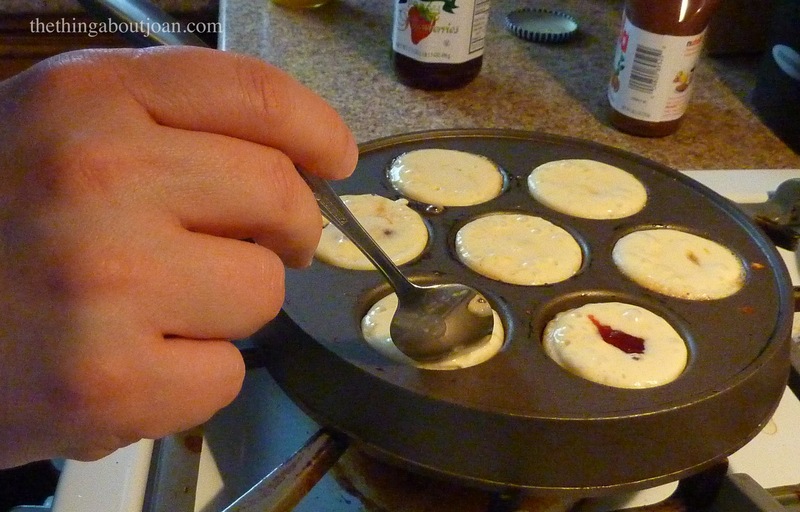 That recipe and pan looks similar to Dutch poffertjes. 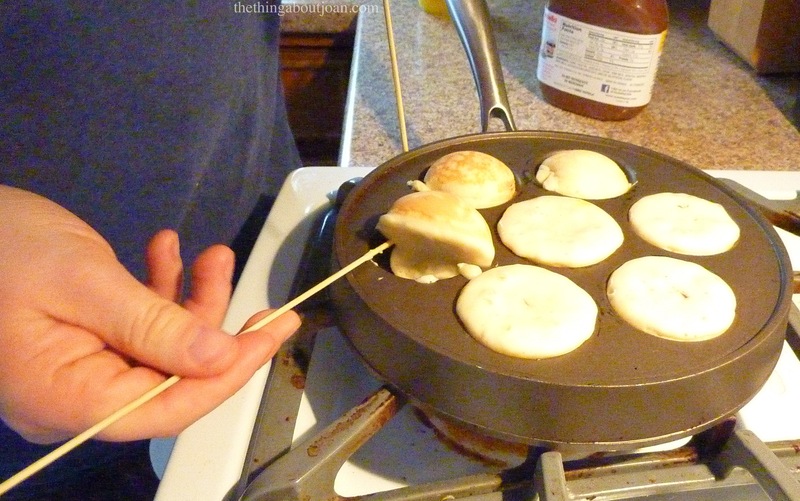 Poffertjes don’t have baking powder though, so end up smaller. I also never used fillings, I will have to try that. Sounds like you have a wonderful (lucky) life. Ooh, now I’ll need to look up a Poffertjes recipe and see if we can make them. I’m intrigued to see what the difference is — especially without baking powder. Oh, do try some with filling and see what you think! It’s my kids’ favorite part (especially with Nutella). And thanks too for dropping by and for leaving the tip about the Poffertjes! A lovely, sometimes funny, and even delicious post. Thanks! Why, thank you so much for the lovely comment, Jennifer! Made my day — I’m lucky that such kind people have clicked into my little corner of the Internet! Please enter your email address to follow me and receive notifications of new posts by email. Thanks so much for reading!